At only 19 years old, Andrew Roy of Frenchville is proud to be the manager of a recently opened gas station and convenience store in St. Agatha. 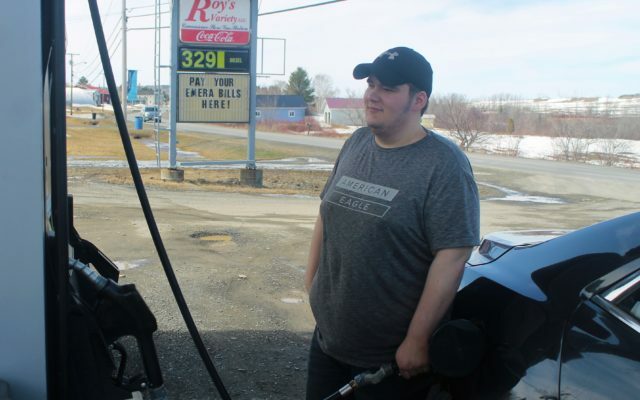 ST. AGATHA, Maine — At only 19 years old, Andrew Roy of Frenchville is proud to be the manager of a recently opened gas station and convenience store in St. Agatha. Roy’s parents, Don and Michelle Roy, owners of Jeff’s Pizza and Subs in Madawaska opened Roy’s Variety LLC., in January and the business has been expanding its operation ever since. St. Agatha’s only gas station, Roy’s offers full-service gas and diesel fuel, as well as convenience store items such as beer, wine, cigarettes and lottery tickets. The business also offers a small selection of groceries such as milk, bread, cereal, canned soups and spaghetti sauces. A full kitchen at Roy’s Variety serves up food from omelettes and home fries to appetizers, dinner baskets and Jeff’s pizza. Customers can eat at dining tables inside the business or take their orders to go. Andrew Roy, a graduate of Wisdom Middle/High School, said he gave college a try but decided he would rather just get to work. Prior to managing Roy’s Variety, Andrew Roy worked for his father at Jeff’s Pizza. “He would leave early and I would be in charge. I had a lot of responsibility,” Andrew Roy said. He added that managing the gas station/convenience store is a different atmosphere than working at a restaurant, but some things are very much the same. Andrew Roy said he and his siblings, including younger brother Ethan Roy who works part-time at Roy’s Variety, inherited a strong work ethic from their parents. “We always had to pay for our own things growing up and we had our jobs,” Andrew Roy said. Roy’s Variety LLC. is located at 276 Main Street in St. Agatha, adjacent to the main snowmobile/ATV trail crossing Route 162. Among the additional services which the store provides are a growing sporting goods section and gas delivery to customers at the St. Agatha marina. “It can be a hassle for people to get off their boats and come up here (for gas), so we will bring it to them,” Andrew Roy said. The business also serves as a pay station for Emera Maine electric bills. Roy’s Variety store hours are 5 a.m. to 9 p.m. Monday through Saturday and 7 a.m. to 8 p.m. on Sunday. Kitchen hours are Monday, Tuesday and Wednesday from 10:30 a.m. to 1:30 p.m. and Thursday, Friday and Saturday from 10:30 a.m. to 8 p.m. The business’ phone number is (207) 543-2075.